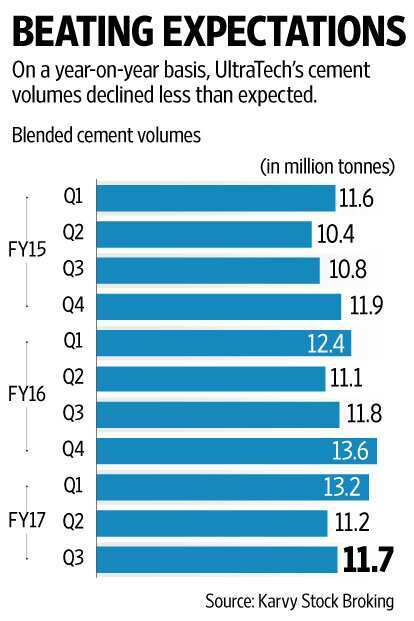 The cement sector was supposed to be among the worst hit by demonetisation. UltraTech Cement Ltd’s results for the third quarter of fiscal year 2017 (Q3FY17), however, show a different picture. Impact on volumes has not been as severe as dreaded. Domestic sales volumes declined 2% at 11.01 million tonnes (mt), lower than analysts’ estimates. Strong demand in south India helped reduce the intensity of the impact on volumes to a certain extent. Overall sales volumes stood at 11.7 million tonnes, down nearly 1% year-on-year. The company’s cost-control measures helped bolster the profit and led to better operating efficiency. Cost per tonne softened thanks to lower power consumption, increased share of electricity produced from waste heat recovery plants and fall in lead distance. Lead distance refers to distance travelled by a vehicle carrying cement from the grinding unit to the market. Every 10km reduction in lead distance results in roughly Rs25 per tonne savings in logistics costs, the company’s management said in a post-earnings conference call, adding that it would continue to focus on this front. Thus, UltraTech Cement’s logistics costs declined by 3% in the quarter gone by, and power and fuel expenses fell 7.45% year-on-year. Ebitda (earnings before interest, taxes, depreciation and amortization) rose 1% year-on-year and Ebitda margin improved 100 basis points to 22%. Realizations remained weak. A basis point is 0.01 percentage point. A tighter hold on costs coupled with higher other income were the saviours in a difficult quarter. As a result, consolidated net profit rose 5.13% year-on-year to Rs594.61 crore in the quarter ended December. Net sales fell 2.53% year-on-year to Rs5,927 crore. A Bloomberg poll had estimated profit and sales at Rs582.6 crore and Rs5,982.3 crore, respectively. As a reward for its better-than-expected results, shares of UltraTech Cement rose more than 2% intraday on BSE on Monday. The company will be setting up a 3.5 mt per annum integrated cement plant at Dhar, Madhya Pradesh, at a cost of Rs2,600 crore. Commercial production is expected to commence by Q4FY19. UltraTech Cement doesn’t have a significant presence in the markets of southwest Madhya Pradesh; this plant would cater to that region. Apart from that, it is also expected to help in reducing lead distances, the company said. Updating about the acquisition of cement assets from the Jaypee Group, the management said the next meeting of the National Company Law Tribunal is scheduled on 15 February and if things go well, the transaction is likely to conclude in Q4FY17 or Q1FY18. Going ahead, a successful integration of this business, revival in realizations and movement of petroleum coke prices are the factors that will be closely watched by market participants. Shares of UltraTech Cement are trading at a one-year forward price-earnings multiple of 30.7 times.